Why should you buy a solar powered security camera or battery-powered security camera with a solar panel? Because solar powered security cameras have a lot of benefits. They use the solar panel to get power from the sun so you won’t need to worry about recharging the battery. They require no cables and power grid to work so you can use them in various surveillance applications, such as remote sites or geographically challenging environments. Finally, the best solar-powered security cameras available today have plenty of intelligent features that can help to protect you, your family and assets. If you are looking for the best solar-powered security camera, this article is for you. Below, we review 4 of the best and top-rated solar-powered security cameras, battery-powered security cameras on the market. The Arlo Pro 2 Home Security Camera may not cheap, but it’s the best solar-powered security camera money can buy. There are many cheaper alternatives out there, but we truly have not found any other solar-powered security camera on the market that offers the same versatility, video quality, combination of software, and value as the Arlo Pro 2. This solar-powered security camera can be powered by the included 2440 mAh rechargeable battery or plugged into a solar power panel, called Arlo Solar Panel. The Arlo Solar Panel is rated at 2 watts and 6 volts and it needs only 5 to 6 hours of direct sunlight to keep the batteries fully charged. It’s adjustable and very easy to install, as all of the ARLO systems. You just need to mount and plug it into the camera and everything will work instantly. You can also use this solar panel to power the Arlo Pro or Arlo Go camera. The panel is weather resistant and it has an adjustable mount for simple installation plus a 6 ft. long power cable for flexible placement. Cable connection to the panel is snug and secured with a latch to keep it in place. Cable connection to the camera itself is also very snug, no concerns about water seeping in. The only little problem with it is that the plug that goes into the back of the camera is large and it might be a bit difficult to adjust the angle of the camera. But we think if you place some sort of mounting shim and then the camera, you should have no trouble with the plug or getting the angle you want. As one of the best solar powered security cameras on the market, the Arlo Pro 2 provides very high image quality and has plenty of features that are a step above most of its competitors. The camera has 1080p sensor instead of 720p in the original Arlo Pro. The increase in resolution is a definite advantage in daytime video quality—you can make out objects farther away, and faces are more lifelike. Even though the camera offers a 130-degree field of view only, we think this is perfect for most applications. While some other solar-powered cameras offer up to 180 degrees of coverage, but in our experience, rarely is that needed — and it tends to significantly distort the image. The Arlo Pro 2 has a ton of advanced features. Two-way audio, motion and sound alerts via the Arlo app, recording of alerts with a three second pre-record, so you capture the moment of an event rather than the aftermath. There’s also night vision. With six of infrared LEDs, the camera provides up to 25 feet of night vision in black and white, and allows you to zoom in up to 8x. You can change the motion sensitivity settings in the Modes. Another extremely useful feature is an integrated alarm. This helps makes this system much more effective than some budget priced solar-powered security cameras. Built into the base unit is a ‘smart siren’ with a 100+ DB output (it can be turned down via the app) which can be programmed to sound if the motion is detected from a particular camera. Now that should hopefully deter any burglar! Finally, one of our favorite features is the ability to control this solar-powered security camera by voice commands. The Arlo Pro 2 works with dozens of other smart home devices via IFTTT applets and Stringify flows, and can be integrated into a SmartThings home automation system. It also works with Alexa voice commands to display video on an Echo Show or Fire TV device. The Arlo Pro 2 solar-powered security camera is very easy to install and configure. It connects to the base station via WiFi signal and the base station connects to your router directly via the included Ethernet cable. The base station provides a steady low-power Wi-Fi connection for up to 15 cameras (though only five can be streamed at once). The Arlo Pro 2 has a nice selection of options for saving your recordings that include both local and cloud storage. 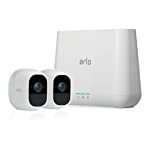 Netgear has a generous free cloud storage program that is included in your purchase of the Arlo Pro 2: seven days (rolling) of triggered events for up to five cameras with limited support for three months. For most users, the seven-day program should be all that’s necessary. If the seven-day free plan just doesn’t provide enough peace of mind, you can purchase a 30-day Premiere or 60-day Elite plan for $9.99 and $14.99 per month, respectively. While the Arlo Pro 2 doesn’t include a slot for a memory card, the base station supports removable storage, so you can save every single clip on a thumb drive or USB hard drive. The Arlo Pro 2 home security camera is our pick for the best solar-powered security camera on the market. It is the most full-featured solar-powered outdoor security system we’ve ever tested. We are particularly impressed with the sheer amount of included features and Netgear’s generous cloud storage plans. You can’t go wrong with it. If you’re looking for a solar-powered outdoor wireless security camera with the spotlight feature, the Ring Spotlight Camera is your best bet. It costs less than the Arlo Pro 2 but it offers an excellent set of features to ward off any intruders. For us, the Ring Spotlight Cam Solar is a simple, effective, low-maintenance way to monitor around the home. You can power the Ring Spotlight Camera with the Ring Solar Panel. This solar panel is designed exclusively for charging the Ring Spotlight Cam Battery. With just a few hours of direct sunlight every day, your Cam will stay charged around the clock. Spotlight solar panel comes with a free toolkit and micro-USB cord, so you can get everything set up in just a few minutes. 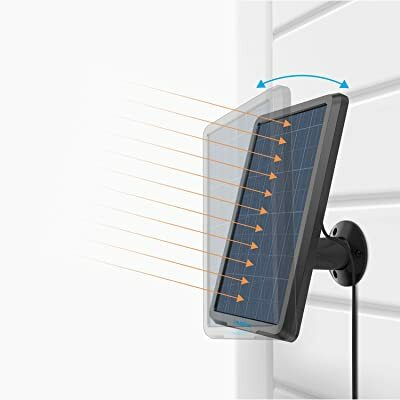 All you need to do is connect the solar panel to your Spotlight Cam Battery with the micro-USB cord, and secure it with the adjustable mounting bracket. The Ring Solar Panel feels a bit more solid than the Arlo solar panel, and it also has a longer power connector, up to 13 ft. Mounted this solar panel easily and connected to the camera easily as well. The only restriction on mounting is finding somewhere the solar panel will enjoy sunlight each day (southern exposure is best, but not absolutely necessary). If you don’t want to run the camera off a solar panel, you can charge the batteries via a mini USB charging port. One battery is rated to last for six months on a full charge. The camera can hold two battery packs and will automatically switch over to the secondary battery when one runs out of juice. As one of the best solar powered security cameras money can buy, the Ring Spotlight Camera offers very sharp video quality with a bright spotlight and many other intelligent features to secure your home against theft. This wireless security camera captures video at 1080p and has a 140-degree field of view. The motion sensor, encased in a dome on the bottom of the camera, has a 270-degree detection range. The camera uses four infrared LEDs to provide up to 30 feet of night vision and has a built-in 110dB siren, an 802.11n Wi-Fi radio, and a speaker and microphone for two-way audio. The spotlight itself consists of two strips on either side of the camera, each with four LEDs that provide an overall brightness of 700 lumens with a 4,000K color temperature. However, the Ring Spotlight Camera lacks the pre-buffered recording capabilities, which shows you what happened just before a triggered event, that you get with Arlo Pro 2 camera and the Ring Video Doorbell Pro. Finally, this solar-powered security camera works with IFTTT and you can use Amazon Alexa voice commands to view video on an Echo Show display or another compatible device. As with most smart home devices, you set up the Spotlight Cam using the Ring app, which is available for iOS, Android and Windows mobile devices. The installation process is very simple and quick. Simply connect the camera to your Wi-Fi network and you’re ready to install. The Ring app includes a step-by-step tutorial with video clips covering everything to help you get the job done as fast as possible. Mounting the camera is also very easy because there’s no wiring involved. Simply find a spot on the outside of your home where the camera can access your Wi-Fi, screw in the mounting bracket, attach the camera to the bracket, adjust it to your preferred angle, and tighten the clamp screw. Protect Plus Plan provides the same for unlimited Ring cameras and adds a lifetime warranty and discounts on Ring products for $10 per month or $100 a year. The Ring Spotlight Camera is one of the best solar powered security cameras for outdoors you can buy. It is a compact, well-built outdoor security camera with a comprehensive array of features to secure your home. The integrated spotlight feature is great as it provides a significant deterrent to opportunistic burglars. If you need a small, inconspicuous security camera that can be mounted anywhere and only takes a few minutes to set up, the Reolink Argus 2 is a perfect choice. This is the best solar-powered security camera that Reolink has made so far and it gets so many positive reviews from users for its ease of use and clear images. Reolink Argus 2 comes with a rechargeable battery, which allows you to charge directly via an outlet or via Reolink Solar Panel. This solar panel is designed for Reolink Argus 2, Reolink Go, and Reolink Argus Pro only. 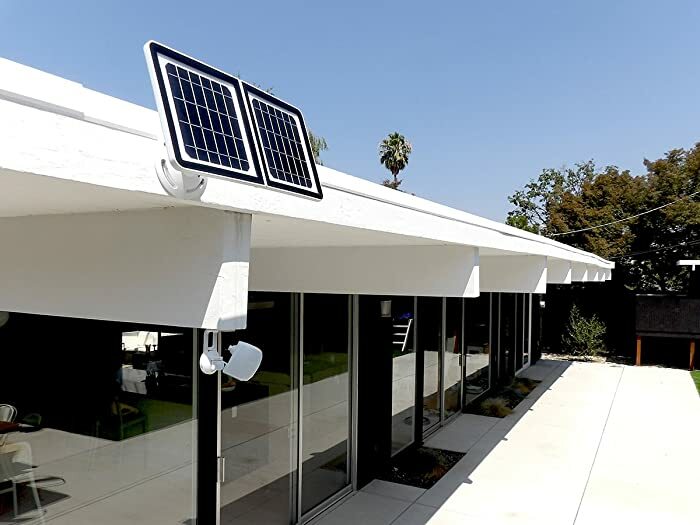 The 360° wall mount of Reolink solar panel for its solar security cameras allows you to easily position the weather-resistant solar panel for maximum sunlight exposure. Reolink solar panel is supported by Reolink 2-year limited warranty and 30-day money back guarantee. The Reolink Argus 2 captures 1080p video at 15fps. It has a 130-degree field of view and uses seven infrared LEDs to deliver very sharp black-and-white night vision video out to 33 feet. It can also deliver color video at night. You can choose between these two night-vision modes in the setting. This solar powered security camera has a highly sensitive PIR motion sensor. You will receive instant app push notifications, email alerts and sound alarms (siren) when motion events are detected. The motion sensor offers three sensitively settings: the furthest distance detection is a claimed 50 feet for large objects such as vehicles, and 29.5 feet for people, animals and the like. Lowering sensitivity reduces false alarms. However, compared to 2 of the best solar-powered security cameras listed above, the Argus 2’s siren is not very loud. Many users complained about this feature. Setting up the Reolink Argus 2 is very easy and straightforward whether you’re going to use the Argus 2 as an indoor or outdoor security camera. 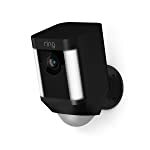 The camera has a built-in magnet that makes it easy to attach to its metal mounting base, you can mount the base to a wall or ceiling if you’d prefer. Reolink Argus 2 is the first and most highly demanded Reolink model that works with Reolink Cloud. Reolink Cloud can record videos every time motion is detected. You can also set up a custom recording schedule for your needs. Reolink Cloud Free Beta Plan offers 10GB of free cloud storage for 15 days (up to 5 cameras). The Argus 2 also stores video locally to a microSD card (up to 64GB). Easy installation, high video quality, and color night-vision make the Reolink Argus 2 Wireless security camera one of the best solar-powered wireless security cameras for home surveillance systems. It is a fantastic option if you want just the security essentials with an easy setup and an affordable price. The final model in our pick of the best solar-powered security cameras is the Lynx Solar outdoor security camera. This camera comes packed with many intelligent features typically found only on more expensive wireless security cameras, such as facial recognition, people and animal detection, and live streaming. You can install it anywhere there’s sunlight and its 7 days of free cloud video storage can save money in the long run. If you don’t know, the Lynx Solar Cam is made by Tend Insights Inc – a California-based firm. Tend is a maker of award-winning lifestyle smart home products powered by computer vision technology. As the name implies, Lynx Solar Camera is an outdoor camera powered by an external solar panel that is included in the package. Lynx solar panel has a large surface that makes it harvest sun power efficient. It only needs 1 sunny day to power the camera for up to 7 days (based on one hour of recording/streaming per day). The solar panel makes mounting and running the camera easy from anywhere on your property, though you’ll want to install it within range of a Wi-Fi access point. The Lynx Solar Cam boasts a 1080p @ 30 frames/sec camera that will operate even in the face of a power or internet failure, as well as a motion detector and fully-integrated facial recognition software. The facial recognition technology is not available in most of its competitors. Thanks to this technology, you’ll be able to upload photos of friends and family and receive notifications when a familiar face crosses your threshold. On the other hand, should a stranger appear in the frame, Lynx Solar can alert you to a potential disruption. You can adjust motion detection and set night vision on or off in the app. There’s a handy button to flip the video image, so it will appear the correct way up if you’ve had to install the camera upside down. As with other best solar-powered security cameras, you can remotely talk and listen through the camera. The Lynx Solar Cam is not designed to work with Amazon Alexa and Google Assistant. Lynx Solar Camera is very easy to install and set up, so it can be placed in any location that best suits your needs. You just need to place the camera in an area of maximum visibility to ensure full home coverage. Then place the solar panel in an area that best captures daylight for round the clock unlimited power. The solar panel has a long power cable, up to 25 feet, so the solar panel doesn’t need to be too close to the camera. If you live in the northern hemisphere, your panels should face true south. If you live in the southern hemisphere, your panels should face true north. If you live in an area where there is snow, you may want to use a steep angle so that it is more likely to shed snow. A snow-covered panel will generate no power. The Lynx Solar Cam includes seven days of video storage in the cloud at no additional cost. But it only records videos when anything that it deems unusual happens. That means it doesn’t store continuous recorded video for free. Only Netgear’s Arlo Pro 2 does. Lynx’s 30-day Premier plan is $9.99 per month/10 cameras. The Lynx Solar Cam also has a built-in memory which is able to store several hours of footage if the camera loses its Wifi connection. When this happens, the camera will store data for 3 days; once Wifi returns, local data is uploaded to the cloud. Although somewhat limited, the Lynx Solar Cam security camera is still one of the best solar-powered security cameras on the market. It’s affordable and easy to use. The included solar panel is effective, backed by a backup battery. And its free cloud storage plan is just enough for most people.